Hastings is the newest county to join the Literacy Ontario Central South region. Hastings County is the second largest county in Ontario, stretching almost 160 kilometers from the Bay of Quinte to Algonquin Park. 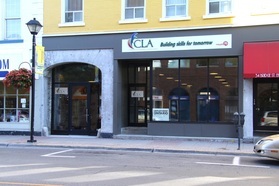 Community Learning Alternatives (CLA) provides upgrading and essentials skills training for adult learners with employment and education goals. CLA will help you determine your strengths and provide instruction to increase skills in your areas of need. Our experienced staff will help you reach your learning goals and plan your next steps. Wherever you want to get in life – a better job, a college education, an apprenticeship – we can help you get there. In just three to nine months you can earn your Grade 12 equivalency, and get started on your journey. And it’s free.